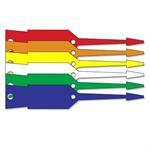 Replace Paper Hang-Ons! Color Coded Numeric Control! High Visibility Control Caps Are Placed On Customer Vehicles To Reduce Search Time. Available in 12 Different colors. 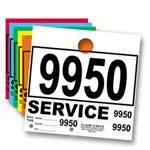 Service Control Numbers - 3 Digit - 1000 Per Box In Stock and Ready to ship. Service Control Numbers - 4 - Digit. 1000 Per Box. In Stock and Ready to ship. 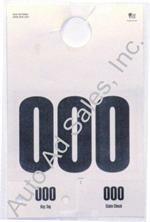 Service Department Hang Tags Plus. Black Printing On white, Green, Red, Blue, Orange And Yellow. 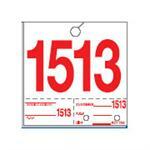 Size 7" x 6 3/4" 20 Pads Of 50 In Each Carton Of 1,000 Tags. Available from 0000 Through 9999. Made of Card Stock Diecut Slot. Perforated Key Tag And Claim Check. Perfect Size To Write On. Must Indicate Starting # 4 Digit Only. 1000 Per Set.